but also the stable supply of coal to its customers. Coal hauling is the process of carrying crushed coal by coal haulers from the crushing plant to the coal stockyard, Tanah Merah Coal Terminal (TMCT) which is 40 km away from the crushing plant. KIDECO ‘s dedicated haul road is a Macadam driveway for all-weather, all-season. 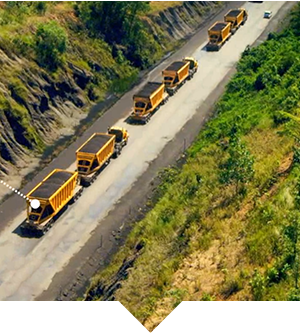 It is much safer and more efficient as coal transport road compared with those of other mines. Currently, coal transport of KIDECO is taken charge of by three companies including PT. MHA, PT. Trasindo, PT. Samindo specializing on coal transport. Coal stockpiling is the process in which coal is transported to the coal stockyard and to be loaded onto the barges for transshipment. 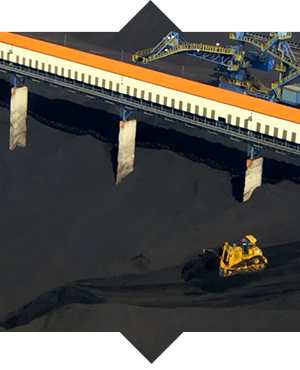 The coal carried by coal hauler is either conveyed to coal stockyard at Tanah Merah Coal Terminal, or loaded directly onto barges. KIDECO equipped its conveyor systems with the automatic samplers which take samples for quality analysis, and with magnetic separators, located at each convyor lines, which seperate foreign materials from the coal. The stockyard capacity of Tanah Merah Coal Terminal is 700,000 tonnes a year. The barge loading facilities can load more than 90,000 tonnes a day, making it possible to reach sales target of over 40 million tonnes a year. 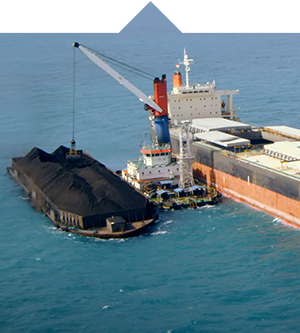 Transshipment is the process of carrying coal by barge from the coal stockyard to the transshipment location, and transshiping coal onto the big-sized vessel waiting at the transshipment location. 8,000 ~ 12,000 dwt barges are towed by 2,400 HP tug boats to KIDECO’s transshipment location, Adang Bay which is 59 km away from Tanah Merah Coal Terminal. Transshipment is done by using either vessel’s own gear or Floating Crane and Floating Loading Facility(F.L.F) at Adang Bay. Adang Bay can handle up to the Cape size vessels (100,000 ~ 150,000 dwt). and to keep an ontime delivery of analysis results to its customers. coal seams of 50~60m thickness, and transported to the crushing plant.